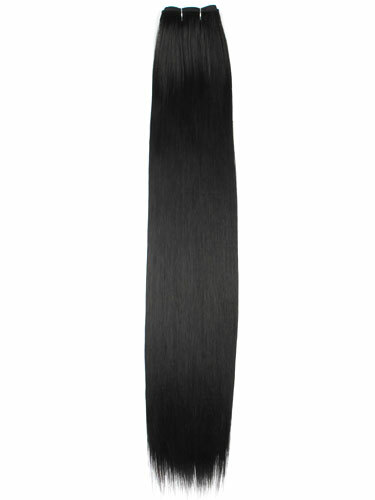 I&K Synthetic 250°C hair weft is made of a heat resistant fiber. It is a fiber developed to overcome the low heat resistance of PVC fiber, and can be curled or straightened using electron irons at home. It can also resist high temperatures because its main material is polyester which has a melting point of 250°C. Heat resistant fiber also can be curled in the dry box. So, it can be curled or straightened to make any hair style. Really nice quality but I bought the lightest blonde and it is not *quite* light enough for platinum (not white) hair. Also, note that you will have to attach clips yourself. i ordered the clip in straight hair and i was very pleased with the hair which i received the next working day. I will be buying more in the future. very pleased with product- just enough for full head (i double all mine up as i have thick hair ) so very satisfied. quality of hair is very good. I read the other reviews and as far as clips are concerned i dont know why you would expect clips to come with them unless it was clearly a package or something like that. I've never used synthetic hair wefts before always worried about tthere quality but these where lovely. they feel just like reall hair if not better. is it just 1 peice of hair or alot 2 cover the full head? I was really pleased with how quick the product came.. however.. nowhere on the page does it state that it doesnt include clips.. so you cant clip it into your hair.. you have to clue them into your hair ..i was dissapointed with this because i wasted my money. RE: Hair Weft does not include clips.